At book talks I often ask: When did you lose your innocence? Common answers include 9/11/2001 and the various political assassinations of the 1960s. Then I ask: When did you lose it again? The trick question is meant to make people ponder a uniquely American situation. Myths are stories we tell ourselves about significant people, real or imagined. But these stories are ultimately and always about ourselves. The idea of innocence lies at the foundation of our national identity. It is as fundamental to our sense of who think we are as alcohol is to an alcoholic. Life for (white) Americans is simply unthinkable without the assumption that we are pure and blameless, and the parallel assumption that our anxieties are caused by some evil Other. For this reason, whenever the terrible complexity of human existence pulls us out of denial and causes us to “lose” our innocence, we very quickly back away from the precipice, revive it and re-constitute it. The cracks that appear in our national veneer of innocence scab over quickly, sealing in the microbes – or the truths – that will inevitably rise to the surface as new infections. Then we lose our innocence again. And each time we do, the experience is so overwhelming that it feels like the first time, because we never really lost it the previous time. It was not always this way. In the tribal world, initiation rituals were so powerful that those who survived them (and many didn’t) were permanently altered, and their communities perceived them as such. Initiates lost their childish innocence and were recognized as adults who possessed a realistic, tragic view of the world, tempered by a clear sense of their own purpose in that world, of the relations with the unseen world and of their importance to their community. As a mythologist, I have very little interest in the actual person John F. Kennedy, nor in what he accomplished, nor in what he believed. Indeed, the tsunami of Kennedy literature has made it impossible to know much about these things anyway. Like all essentially mythic figures, he and his entire clan have become Rorschach projection figures for our imagination. Amazon lists some 6,000 books on the Kennedys. Another source lists 40,000. This November 2013 alone, at least 140 books have been or will be released, timed for the 50th anniversary of the assassination. All purport to tell the “truth.” But to a mythologist, one truth merely points to another truth, and sometimes that truth looks like the opposite of the first one. Nor, in this article, am I interested in the question of who killed him or why – you already have your own opinion – except as how the issue has become part of our modern narrative. What I am interested in is the mythological issues: how myths drive us and how they are created. 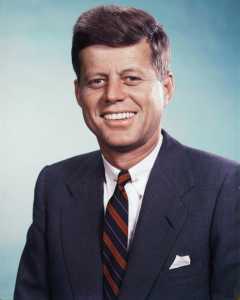 JFK and his family represented youth, romance, vigor, health, enthusiasm, promise and a revival of the nation’s ideals. His rhetoric of a “New Frontier” evoked the nation of boundless possibilities. He knew very well that the idea of the new start is at the very core of the myth of America. It is, in fact, the very meaning of America. Our mythology, however, tends to ignore the universal and ecological understanding that initiation requires the death of what came before. So does our New Age thinking, which highlights rebirth without acknowledging death. The Kennedy myth – at least until the assassination, and possibly until his brother’s death 4 ½ years later – reinforced the characteristically American notion that history moves inexorably toward a state of more freedom, more opportunity, more equality and an American Dream for everyone, including all those poor folks in the Third World who so need to be saved and liberated by American armies. As we’ll see below, however, the myth of Camelot helped negate the belief in progress for millions. Americans share a superficial aversion to the trappings of European royalty. But America was formed in what Joseph Campbell called a “demythologized world” that has long lacked transcendent mythic figures. So precisely because of our egalitarian ideology – and especially since the age of the movies began – we have searched for public figures who can hold our projections of Kings and Queens. This is the shadow side of a society that claims democratic values and refuses to admit that it is not classless. Usually these ideal figures have been movie stars and athletes, the stock characters of our cult of celebrity. But actual royals carry an extra attraction. To this day, it is no coincidence that a typical week of PBS television includes endless adulation of the British royal family and its related aristocracy, including the denizens of Downton Abbey. And every November, as a warm-up for Thanksgiving, that adulation shifts to the American royal family. The Kennedys, unlike their benign but boring predecessor Dwight Eisenhower, were glamorous, sophisticated, physically attractive, well educated, articulate and cultured. They appeared to be comfortable around actual movie stars. And they were only too happy to help perpetuate the image of aristocracy. It was easy to imagine JFK as a king of divine right out of a much earlier time. He was, wrote one writer, “the subject of endless reverie about his capacity to renew the world.” This capacity to stand at the center of the realm and ritually proclaim the annual renewal of the world, the crops (and the psyche) is one of the characteristics of the archetype of the King, It is the very essence of the idea of the “New Start.” The King is the central archetype of the collective unconscious. He represents order, fertility, stability and blessing. He is a focal point for communal desire and selfless service devoted to a higher order of existence. In 1960 Kennedy perceived this massive longing for meaning, tapped into it and reframed the classic American value of “opportunity,” which had always meant getting rich, or to “con” someone else (see my series on the Con Man), or (to conservative critics of the New Deal) to take advantage of government aid. Shortly after taking office, he established the Peace Corps, and thousands quickly joined up, delighted to be part of a non-militaristic attempt to make a better world. Now opportunity implied the chance to participate in something greater, to build a new world without either the violence of empire or the trappings of Christian fundamentalism. Kennedy, like his predecessors, denounced Soviet aggression and glorified American freedom. Yet this advent of the archetypal King energy was, in a very subtle way, calling into question some of the basic values of capitalism itself. At a time when the nation hadn’t fully completed its transformation from Protestant frugality to a consumer culture, this (in the eyes of what we now call the Deep State) may have been his greatest transgression. A secondary aspect of the archetype of the King is our longing for the return of the King, as exemplified by the Greek stories of Odysseus, the Hebrew expectation of the Messiah (originally mashiah, and rendered in the Septuagint translation as the Greek Khristos) and significantly, King Arthur of Camelot. This is a universal mythic theme, but it has particular meaning for us, because a primary characteristic of the central type of figure in American myth, the Hero (whom we often confuse with the King) is that once he saves the innocent community, he leaves that community. Our Kings have all moved on, westward, toward the setting sun and the Other World, and we long for the imagined times and places where they once peacefully ruled over us and our service to them gave our lives meaning. That longing for a savior figure grows along with our dissatisfaction with our sense of the nation. It is so potent that in the age of Trump, it allows us to overlook a strongman’s obvious human frailties, at least for a while. Many Trump voters are old enough to have voted for Kennedy in 1960, and polls tell us that many of them voted for Obama 48 years later.